(Nanowerk News) What do you get when you wrap a thin sheet of the "wonder material" graphene around a novel multifunctional sulfur electrode that combines an energy storage unit and electron/ion transfer networks? An extremely promising electrode structure design for rechargeable lithium-sulfur batteries. In the journal APL Materials ("Graphene-wrapped sulfur/metal organic framework-derived microporous carbon composite for lithium sulfur batteries"), a team of researchers led by Dr. Vasant Kumar at the University of Cambridge and Professor Renjie Chen at the Beijing Institute of Technology describe their design of a multifunctional sulfur cathode at the nanolevel to address performance-related issues such as low efficiency and capacity degradation. Schematic of the preparation of a 3-D hierarchically structured graphene-sulfur/carbonZIF8-D composite. Metal organic frameworks (MOFs) have attracted plenty of attention recently, thanks to wide-ranging applications in hydrogen storage, carbon dioxide sequestration, catalysis and membranes. 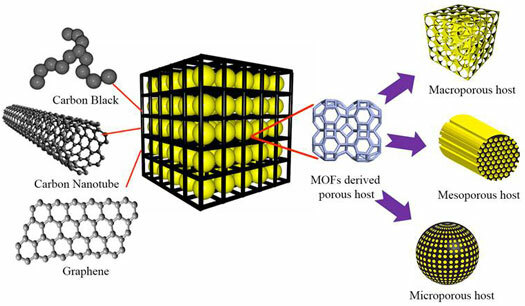 And to create their cathode, the team tapped MOF "as a template" to produce a conductive porous carbon cage -- in which sulfur acts as the host and each sulfur-carbon nanoparticle acts as energy storage units where electrochemical reactions occur. "Our carbon scaffold acts as a physical barrier to confine the active materials within its porous structure," explained Kai Xi, a research scientist at Cambridge. "This leads to improved cycling stability and high efficiency." They also discovered that by further wrapping the sulfur-carbon energy storage unit within a thin sheet of flexible graphene speeds the transport of electrons and ions. What's behind the improved capacity? Fast charge-transfer kinetics are made possible by an interconnected graphene network with high electrical conductivity, according to the team. Their work shows that the composite structure of a porous scaffold with conductive connections is a promising electrode structure design for rechargeable batteries. This work provides a "basic, but flexible, approach to both enhance the use of sulfur and improve the cycle stability of batteries," Xi said. "Modification of the unit or its framework by doping or polymer coating could take the performance to a whole new level." In terms of applications, the novel battery design's unique integration of energy storage with an ion/electron framework has now opened the door for fabrication of high-performance non-topotactic (not involving a structural change to a crystalline solid) reactions-based energy storage systems. What's next for the team? "We'll focus on fabricating hybrid free-standing sulfur cathode systems to achieve high-energy density batteries, which will involve tailoring novel electrolyte components and building lithium 'protection layers' to enhance the electrochemical performance of batteries," noted Xi.